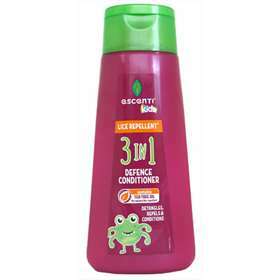 Escenti Kids Lice Repellent 3 in 1 Defence Conditioner..
Escenti Head Lice Repellent Conditioner is specially formulated to condition and refresh your hair leaving it healthier, shiny and manageable. It contains pure tea tree oil to help protect your hair against head lice infestation and a special anti-tangling ingredient to help make hair easier to comb. Apply to wet hair after shampooing with Escenti Tea Tree Lice Repellent Shampoo. Massage to the ends of your hair and leave for 1-2 minutes.